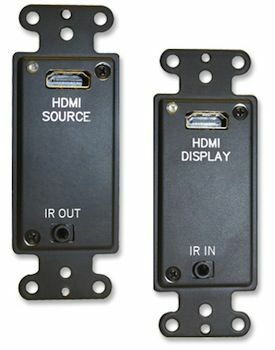 Covid is now shipping their new HDBase T Wall Plates, a convenient and cost effective (2) plate solution for running HDMI long distance. This system features the standard Covid decora style wall plates with built-in active chipsets, located on the back side. Using CAT5E or CAT6 cable, extend HDMI signals up to 180ft. at 1080p and up to 230ft. with CAT7. Optionally, the plates are offered with IR control for easy remote use and color choices including black or white. Power is required for only one side while the other is powered via UTP. They are HDCP/EDID compliant and feature a status LED on the front side.